On March 27, 2019, UMBC graduate students will gather in the University Center Ballroom to improve their communication skills, share their work, and get to know their UMBC colleagues. The new Graduate Experiences, Achievement, and Research Symposium (GEARS) aims to provide rich professional development opportunities—from showcasing art pieces to mingling with alumni—for students in all fields, right here on campus. “We want to provide an avenue for people to learn skills that they’re not going to get in the classroom or the lab,” says Alex Rittle, Ph.D. student in geography and environmental systems and chair of the GEARS planning committee. The opportunities at GEARS include an interviewing workshop led by Susan Hindle, assistant director for internships and employment; an art showcase by students in UMBC’s Intermedia and Digital Art program; an exhibition by emergency health services graduate students; short “Gritty Talks,” modeled after the annual GRIT-X talks at UMBC Homecoming, and traditional poster presentations. GSA vice president Adam Harvey discusses science communication with a colleague. “Preparing a good poster can be more difficult than preparing a talk, but it can provide more bang for your buck,” says Roy Prouty ’16, M.S., atmospheric physics, current M.S. student in computer science, and Graduate Student Association president. Choosing what data to include and laying it out in a way that is easy to follow can be challenging. To help, the GSA organized a workshop prior to GEARS run by Tim Ford, manager of Research Graphics in the College of Natural and Mathematical Sciences, and Joe School, director of the Cartographic Services Laboratory in geography and environmental systems. Both have decades of experience printing posters, and know what makes a good one. GEARS will also feature a Three Minute Thesis (3MT) competition, the winner of which will compete at the Southern States Regional 3MT contest. The Graduate School supported training from renowned communications coach Scott Morgan for all students who signed up in advance to participate in 3MT. “Regardless of whether you’re going into industry, the public sector, or academia, you need the skills to be able to tell people what you’re working on,” says Rittle. 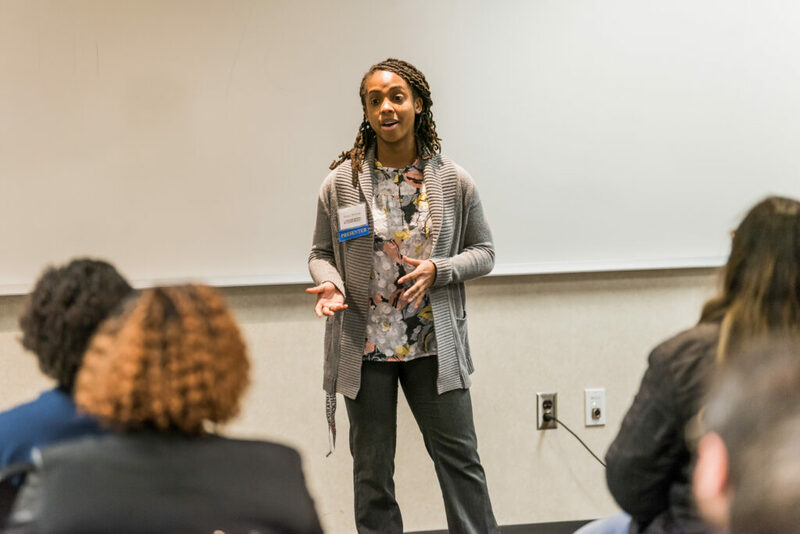 Denise Williams, Ph.D. student in chemistry, presents at a GSA event in 2018. 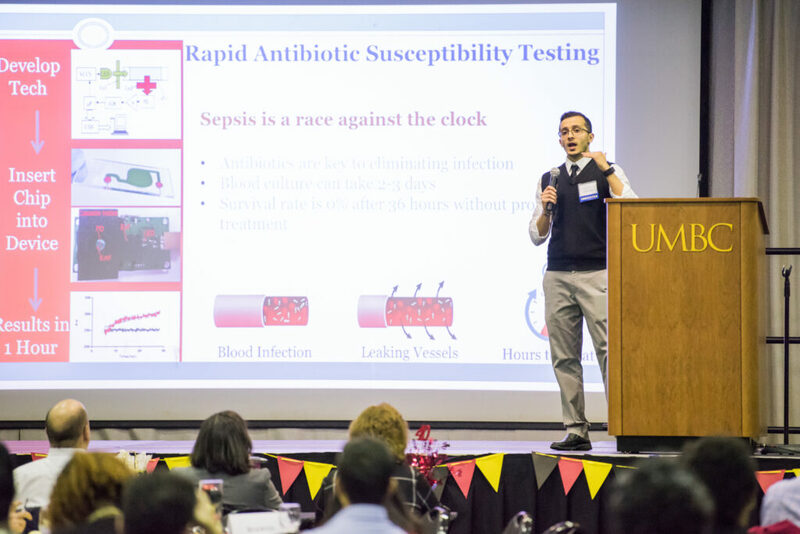 Mustafa Al-Adhami, Ph.D. ’19, mechanical engineering, and a researcher at UMBC’s Center for Advanced Sensor Technology, won last year’s 3MT and found the experience transformative. After winning at UMBC, he came in second place the Southern States Regional, earning him the right to compete at the national 3MT competition this coming December. “In real life, I feel like you don’t get more than three minutes,” Al-Adhami says. “So practicing how to do it is valuable.” Al-Adhami is also an entrepreneur, and less than a week after the 3MT regional, he won the elevator pitch contest at the Baylor New Venture Competition in Waco, Texas. “What I learned from 3MT transferred into a totally different enterprise,” he says. Al-Adhami will present his talk after the competitors at this year’s 3MT contest. Mustafa Al-Adhami, Ph.D. ’19, mechanical engineering, gives his three-minute thesis talk at the 2018 UMBC Graduate Research Conference. GEARS isn’t all serious professional development, though. A social hour where current graduate students can mingle with Graduate School alumni will close out the day. One of the highlights? An activity known as Powerpoint roulette, where participants are given a random Powerpoint slide from an academic presentation and must try to explain it on the spot. There will be prizes in different categories, like most realistic and most creative. Banner image: Alex Sestok, Ph.D. student in chemistry, explains her research to a guest. All photos by Marlayna Demond ’11 for UMBC.